A long, long time ago, a woman named Oiwa was married to a man named Iemon and they lived in Yotsuya. One day, a rich lady fell in love with Iemon and captured his heart with her money. Iemon ordered his servant “Put a little of this medicine into Oiwa’s every meal”. Day by day, Oiwa grew weak, lost her hair and the right side of her face became deformed. After this she was treated cruelly by the people around her and she died holding a grudge against them. After her death many strange things happened and all of the people who had mistreated her died. Iemon‘s wife Oiwa was born here, and it was here that she lived out a dramatic and tragic life. 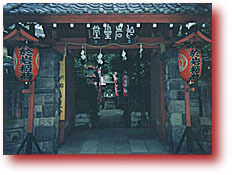 After her death, people built the Inari Shrine in her memory. This is Oiwa‘s grave. She died on February 22, 1636. They say that if you stand here and wish hard enough then your wish will come true. If you proceed straight through the graveyard, you will find a red torii(a Shinto shrine archway) and a large tree. Her grave is under the tree. They say that if it is only out of curiosity that you visit Oiwa‘s grave, then your right eye will become swollen, just like hers was. Yotsuya Kaidan (四谷怪談), the story of Oiwa and Tamiya Iemon, is a tale of betrayal, murder and ghostly revenge. Arguably the most famous Japanese ghost story of all time, it has been adapted for film over 30 times, and continues to be an influence on Japanese horror today. Written in 1825 by Tsuruya Nanboku IV as a kabuki play, the original title was Tōkaidō Yotsuya Kaidan (東海道四谷怪談). It is now generally shortened, and loosely translates as Ghost Story of Yotsuya. First staged in July 1825, Yotsuya Kaidan appeared at the Nakamuraza Theater in Edo (the former name of present-day Tokyo) as a double-feature with the immensely popularKanadehon Chushingura. Normally, with a Kabuki double-feature, the first play is staged in its entirety, followed by the second play. However, in the case of Yotsuya Kaidan it was decided to interweave the two dramas, with a full staging on two days: the first day started with Kanadehon Chushingura from Act I to Act VI, followed by Tōkaidō Yotsuya Kaidanfrom Act I to Act III. The following day started with the Onbo canal scene, followed by Kanadehon Chushingura from Act VII to Act XI, then came Act IV and Act V of Tōkaidō Yotsuya Kaidan to conclude the program. The play was incredibly successful, and forced the producers to schedule extra out-of-season performances to meet demand. The story tapped into people’s fears by bringing the ghosts of Japan out of the temples and aristocrats’ mansions and into the home of common people, the exact type of people who were the audience of his theater.